A DEVASTATED former Lockerbie lass is offering a £6000 finders fee to anyone who can help nd her missing puppy. 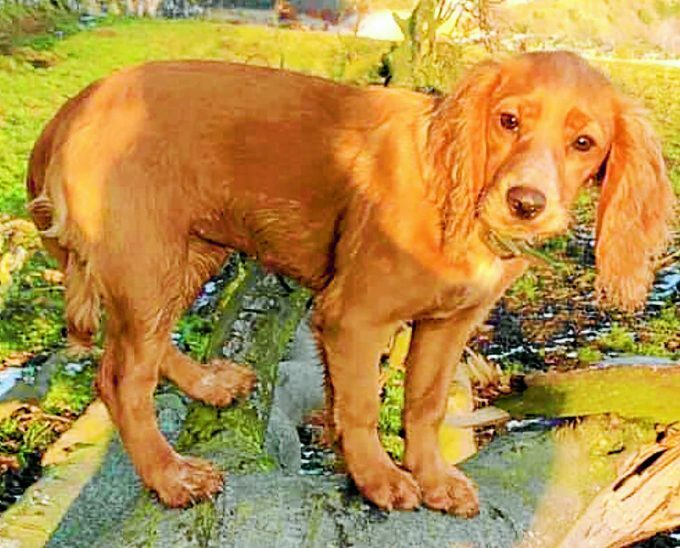 Fiona Anderson’s seven- month-old cocker spaniel, Harper, went missing last Thursday from her home on the outskirts of Lanark. And since then Fiona, who went to Lockerbie Academy, has launched a huge campaign to get her beloved pooch back, with thousands joining the search both on foot and online and many in this region sharing her social media posts. Fiona said: “She went missing from the garden, we don’t believe Harper went off herself asit’snotinhernature…she hates being alone. Fiona and boyfriend James Howatson immediately placed a £2000 reward on Harper’s safe return, later upping the fee to £6000 to get back their precious pup. So far over 3000 people have joined a special Facebook page – https://www.facebook.com/groups/HelpFindHarper/ dedicated to her safe return, sharing pictures of the pup and helping conduct searches. Friends fear the pup may have been stolen and have taken to trawling sale sites trying to find dogs for sale that match young Harper’s description. Fiona said: “The support already has been amazing and we hope to keep it going. Appealing to the public, she added: “The finders fee is £6000, if anyone has any information at all please to get in touch with us. “It isn’t the same without her, she has the biggest heart and loved people, thinking about what she could be going through is breaking us. Harper has a slight white patch on her face, a white chest, two white back feet, a docked tail and is microchiped. You can now read the latest Annandale Herald online using our new Digital service.